Washington’s Preston Hines (33) passes the ball during a non-conference match at Circleville Thursday, Aug. 23, 2018. Also pictured for the Blue Lions is Bryce Coy (25). CIRCLEVILLE The Washington Blue Lion boys soccer team tied 1-1 in a nonleague match at Circleville Thursday evening, Aug. 23. Both teams were playing their second game of the season and both were looking for their first win. 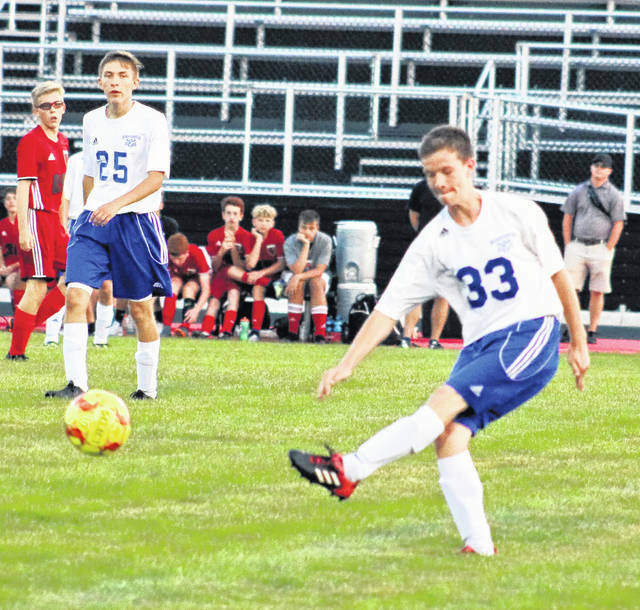 It was a matchup of freshman goalkeepers as the Tigers’ Nick Burns went to work against the Blue Lions’ Garrett Dewees. Each keeper surrendered a first half goal and remained solid throughout. Circleville scored first at 13 minutes into the game after Washington partially cleared a corner kick before a Tigers’ midfielder buried the rebound from 20 yards out. Washington equalized just two seconds before halftime on a hustle play as juniors Shlok Shah and Grant Kuhlwein chased an errant Circleville pass through the defense. Kuhlwein stripped the ball from the keeper and scored in an open net. The second half was an intense 40 minutes, with Circleville having the majority of the chances to score, but both defenses held strong. Blue Lion head coach Aaron Teter was pleased with his team’s toughness following the game. Washington (0-1-1) will host Wilmington Saturday morning with the Lady Lions kicking off at 10 followed by the boys. The Lady Lions lost to Circleville Thursday, 7-0. Washington will be at HIllsboro Tuesday and home against defending FAC champions Chillicothe Thursday. The boys’ matches start at 5 p.m. and the girls’ at 6:45 p.m.